Eben managed to catch a decent fish! I am going to be in Patagonia at the end of February into March to host a trip for Orvis Travel. So I decided to put together a week for Hubbard’s clients right after that. I have March 4 to March 11 reserved at Magic Waters for the group. Check out this page for more information. You can leave comments/questions here on the blog, you can email me at eben@hubya.com, you can call me on my cell at 602.228.8775 or at the lodge at 406.848.7755 for more info, etc. 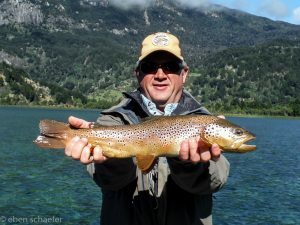 Previous Previous post: Patagonia – The Fishing!